Looking for a quiet interlude on your island-hopping yachting vacation? Tinos is a magnet of calm and natural beauty. There are terraced hillsides and verdant mountains, dotted with villages and elaborate dovecotes — a relic of its Venetian history — to help you unwind and revel in a simpler time. With a luxury yacht at your disposal, you can cruise the shoreline, find a sheltered hideaway and kick back with some swimming, snorkeling, kite- and windsurfing. Tinos is probably best known for its sacred Greek Orthodox pilgrimage site, the Church of Panagia Evangelistria, in Hora. 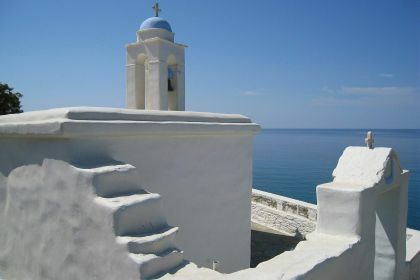 Not only is it a major landmark on the island, it is also one of the most important centres of Greek orthodox worship. The streets leading from the harbour to the Cathedral is lined with stalls selling devotional rugs, votive candles and rosaries, a nod to the pilgrims who visit this sacred site from all over the world. The atmosphere of devotion is strong, and you are sure to sense it before you see it. Of course, while here, it is worth seeing the famed icon of the Virgin Mary. Another recommended site in Hora is the Museum of Marble Crafts: this small but elegant museum showcases the work of local artists and offers an overview of how marble is mined and processed. 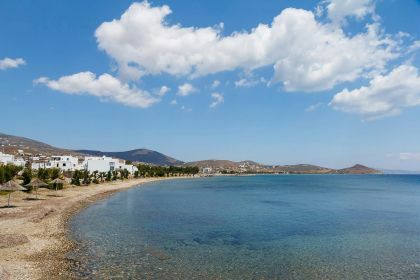 Tinos is also known for its unspoilt and secluded beaches. The southern side in particular is protected from the wind, and features iconic beaches such as Agios Ioannis Porto, Agios Sostis, Agios Romanos and Kionia. The inhabitants of Tinos take their food seriously and host a variety of annual food festivals. 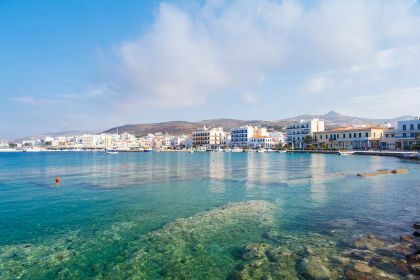 Tinos is also a gourmet delight, with restaurants aplenty serving wholesome, authentic Greek cuisine and fresh seafood. Think of wild artichokes, spaghetti with the freshest prawns or mussels, octopus with vegetable sauce, aubergines, flavourful local cheese or rabbit ravioli…. For a convivial atmosphere, great service and exceptional food, highly recommended eateries include Itan Ena Mikro Karavi or O Ntinos. 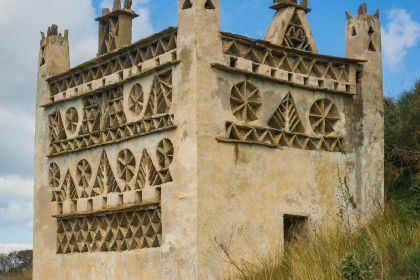 Insider tip The Venetians introduced pigeons to the island several hundred years ago, and Tinos is now known for these intricately designed white structures dotted around the island, particularly near Krokos Village, Komi and Tarabados Valley. During the Venetian reign, only the nobility were permitted to breed the birds, but the locals have now kept this tradition going. You can call us or leave your charter enquiry here and we’ll make sure you get the most from your yachting holiday to this magical Greek island. We are here to help you plan every last detail of your memorable island-hopping adventure in the Aegean Sea.